It’s the new year which often means a time where we set lofty goals for improving ourselves. That may include staying more organizing, eating healthy, or doing a better job of staying in touch with long distance friends and relatives. But what about new years resolutions for your home? Cleaning out your closets and getting rid of unwanted/unneeded items is a great start. In fact, we’re pronouncing 2016 as the year of minimalism. Another great resolution for your home is to give it a makeover! This could be as simple as swapping out pillows to give your space new life. 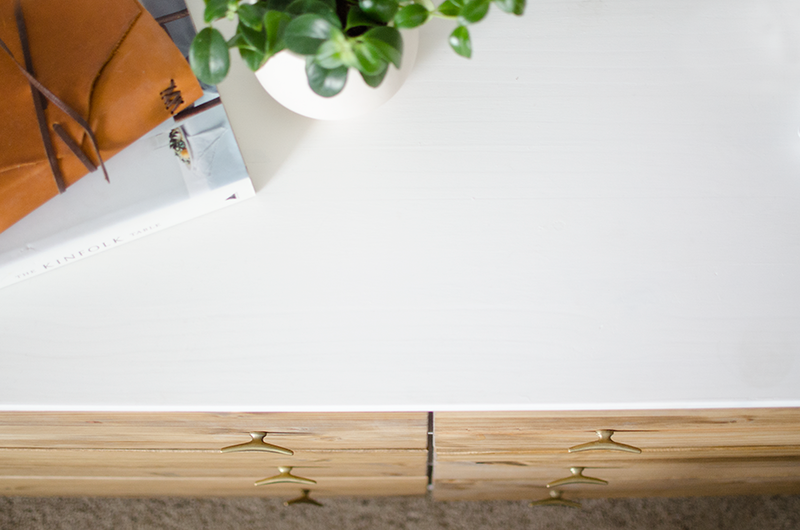 Or, it could mean investing in new furniture pieces to help organize your space (and gives you a good reason to get rid of items you’ve had for years that doesn’t fit your style anymore). 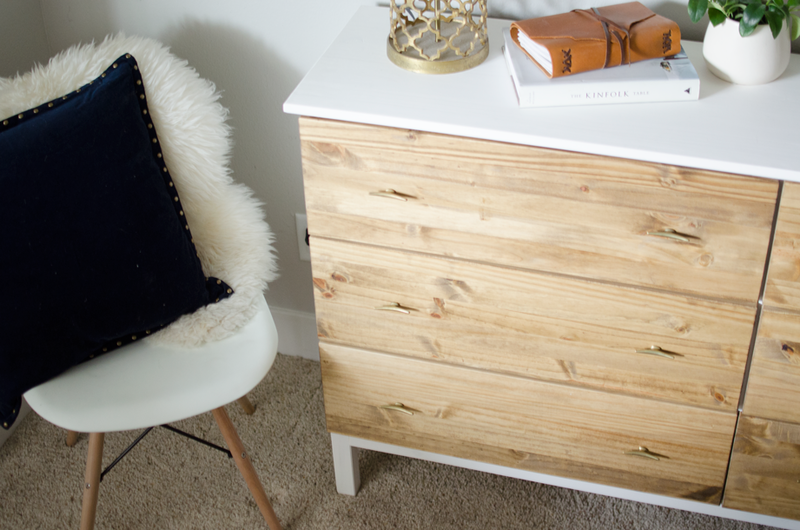 Whatever the reason, we have an easy DIY that will transform your bedroom without breaking the bank. Yes, it’s another infamous Ikea hack! 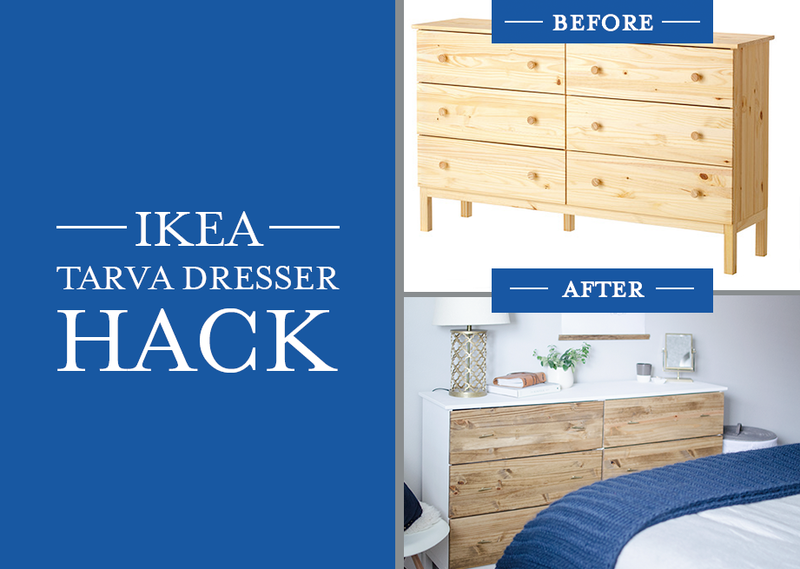 To start, make a trip to Ikea (either in store or online) and track down the Tarva dresser. While ordinary at first glance, there is a lot to work with! 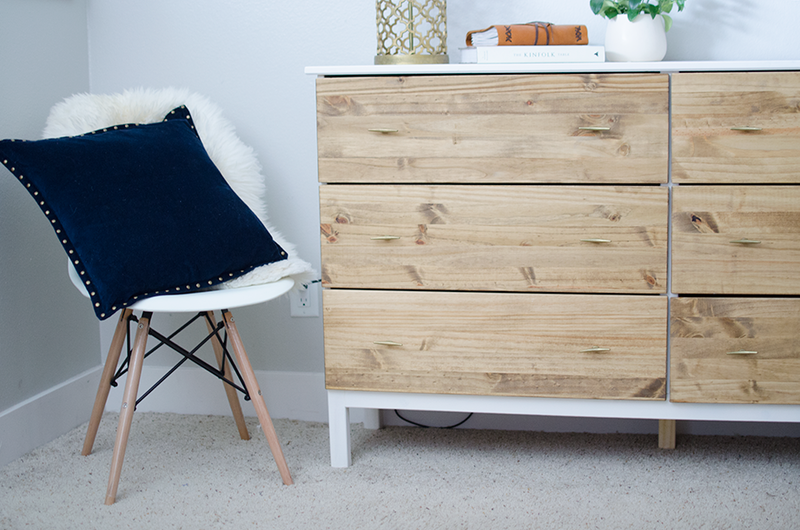 The natural unfinished wood provides the perfect canvas for a DIY project. The rest is pretty simple. Just choose a stain and paint color that goes well with your space. We choose a walnut stain and white paint. And believe us, the possibilities when it comes to white paint are endless! We didn’t choose pure white as we wanted it to have a softer tone to it, so we settled on an off white color with slight yellow undertones. We loved how it turned out! Convinced to try this for yourself? We’ll walk you through the steps we took to create this look, but feel free to take this project and make it your own! This is the most daunting part of the project. As you sit on the floor surrounded by 100 pieces of wood, screws, etc. don’t fret. It’s not as difficult as it looks! 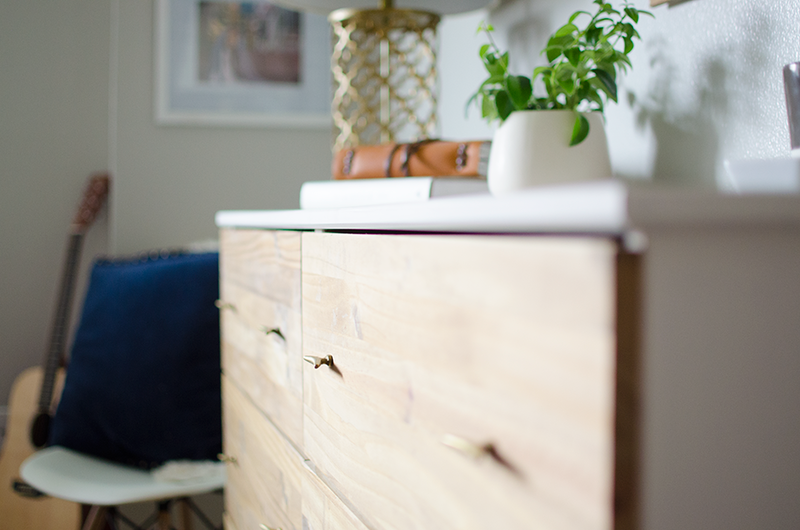 The instructions that accompany the dresser walk you through the process step-by-step with images. All in all, it took us about an hour to construct the dresser. 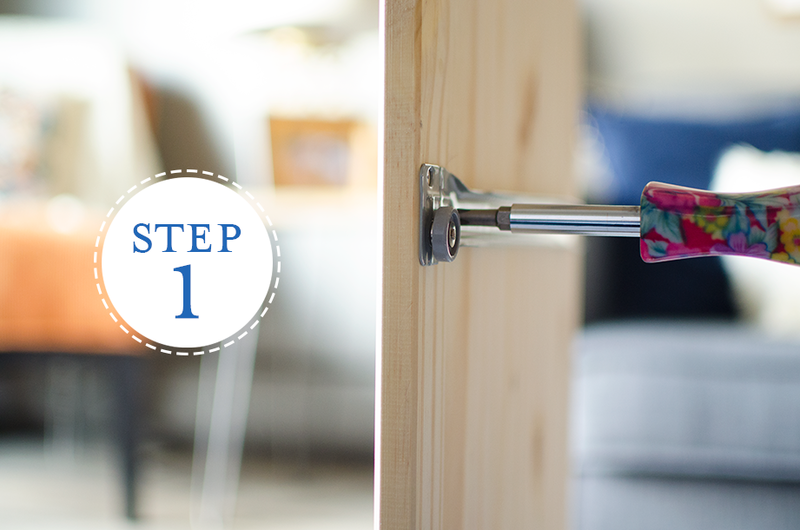 Note: We recommend skipping the step of adding the dresser backing for now. It’s much easier to paint without it. 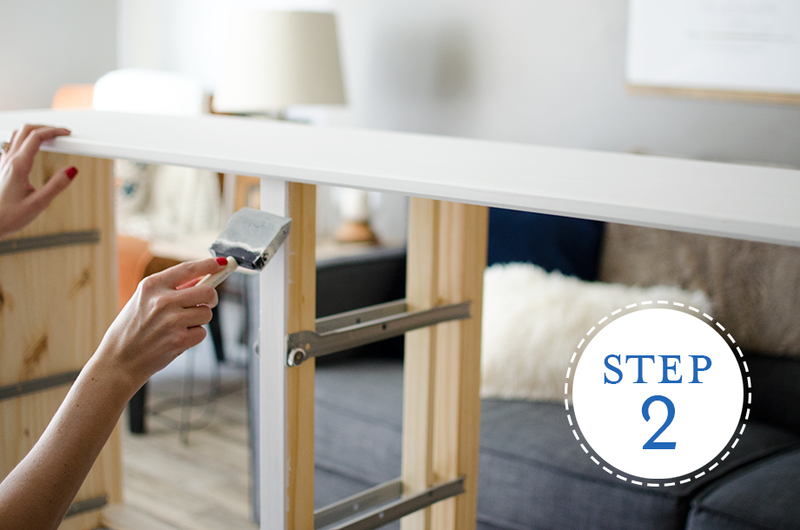 Once your paint has dried, grab your hammer and nail the backing to complete the look! Set the drawers aside for now and get started painting the frame. Lay down your tarp, and begin coating the dresser evenly with the paint making sure to go with the grain of the wood. It’s best to add the paint in thin coats to avoid drips. Just make sure you wait for the paint to dry completely in between coats! It took us two rounds of painting to cover the wood. It still has a slight wood grain look to it, which we preferred, so add another coat if you prefer to have a more solid look to the paint. 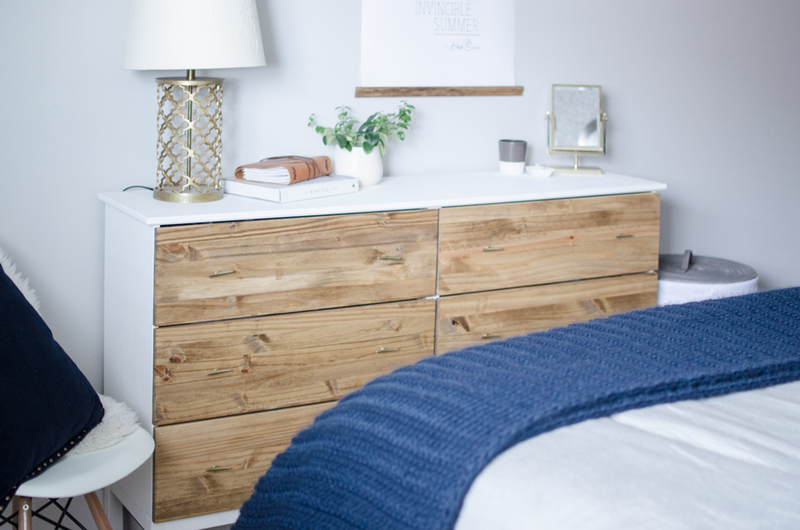 Once the paint is dry and you are happy with the finished look, add the backing to the dresser before moving on to the next step. Now that the frame is painted, it’s time to move on to the drawers! 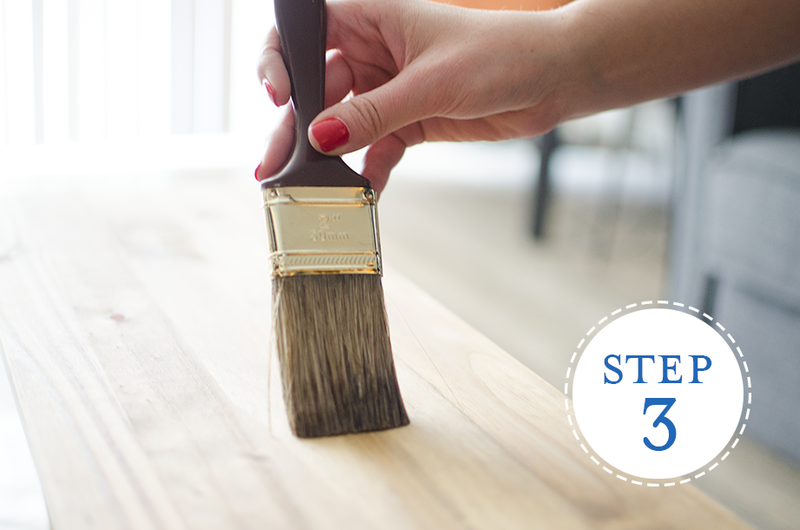 Using a paintbrush or rag, lightly coat the drawers with the stain. Again, the number of coats you add depends on your personal preference. Just know that the more stain you add, the deeper/darker the stain will appear. We choose to add one coat of stain so more of the wood grain would show through. 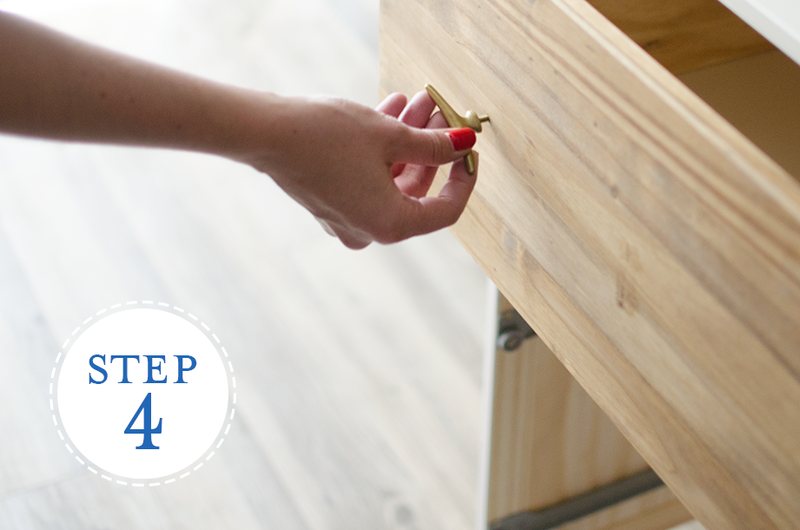 Once you’ve added the stain to all the drawers, wait for them to dry completely before you assemble the dresser. Note: if you stumble upon a drip, or an area where the paint is too thick, this is where the sandpaper comes in. Lightly sand the area to help smooth it out. This also works well if you notice brush strokes in the paint! At this point, you have the option to add a clear protective coat, which we recommend! Adding a protective coating will help preserve the wood and prevent it from getting stains and/or water marks. It also makes it easier to wipe down and clean. You’re almost done with the project! 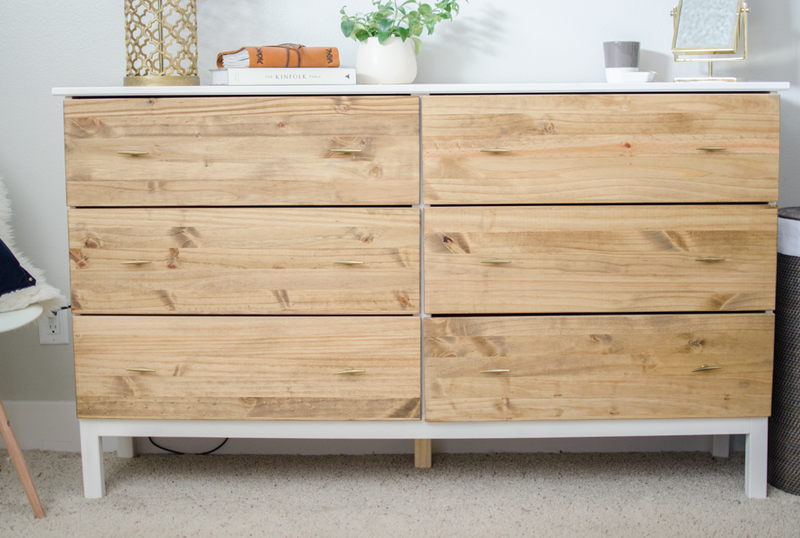 The last step involves adding your preferred hardware to the drawers. We particularly loved the look of these gold ones from Anthropologie, but there are endless options out there to choose from! Anthropologie has some fun colored ones, too if you want to add a pop of color or visual interest to your dresser. 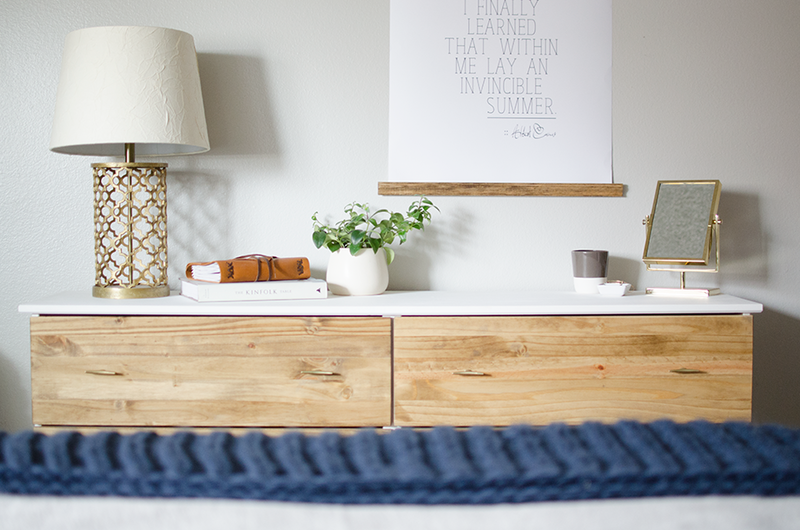 Now that that’s all done, the only thing left to do is style your dresser. 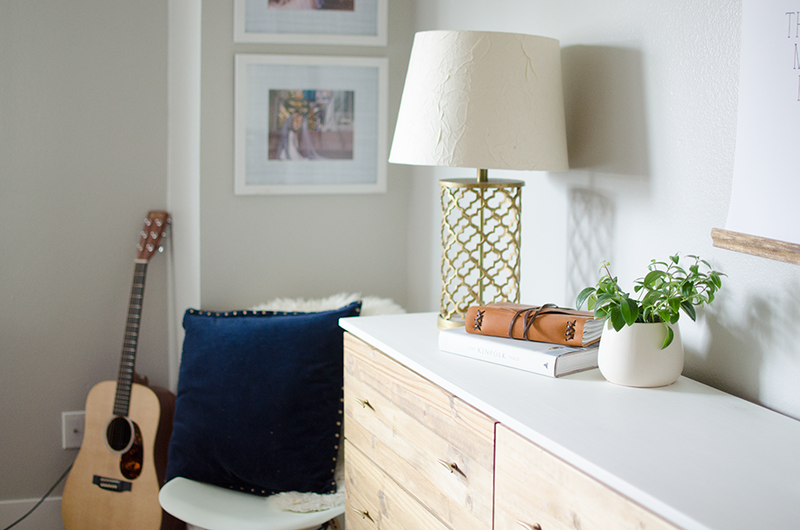 We recommend hanging a fun art print or a mirror about the dresser to pull the look together! What do you think of the finished look? If you attempt this DIY yourself, please share your photos of the end results in the comments below! Like the styling from the photos? Get the look!